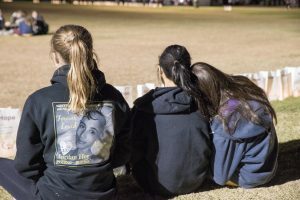 An eighteen-hour relay might not be everyone’s cup of tea, but for more than 80 Westside students, it was a night they will never forget. It’s 3am and while the world sleeps, hundreds celebrate the Ipswich Relay for Life, an initiative of the Queensland Cancer Council. Among those bearing the cold and wind are 80 secondary students and staff from Westside, the largest single group and largest school represented in the event. Westside Christian College represented more than 10 per cent of the 58 teams registered for the event and more than 15 per cent of the total participants. Our students and staff, spread across six teams, walked among the glow of hundreds of candles, glowing gently into the night. The candles illuminated messages for departed loved ones “Until we meet again“, “I’m so proud of you” “I miss you more every day” “Gone, but not forgotten.” Many of those messages were for one Westside student, who lost his battle with a rare form of juvenile cancer in 2015. Three students pause to remember a loved friend who passed away in 2015. Westside Christian College has a proud history of participation in the event frequently breaking fundraising and attendance records. In 2016, Year 11 student Tahlia Dickson was recognised as the largest single fundraiser in the Ipswich event. Our participation is a part of Westside’s Radical Acts of Kindness program, which aims to turn students’ attention towards the needs of the community and prepare them for a life of service. Rugged up but determined, our staff and students walked, ran, jumped, cartwheeled and hopped their way around Bill Paterson Oval. By all accounts, students had a great night full of laughter and fun. Whether alone or together, they were joined in spirit, celebrating loved ones who survived, their carers and those who lost their battle with cancer. Several of the Westside team walked with the survivors and their carers during the victory lap. Westside Christian College wishes to thank our students, staff and parents for their dedication to peace, love and community.